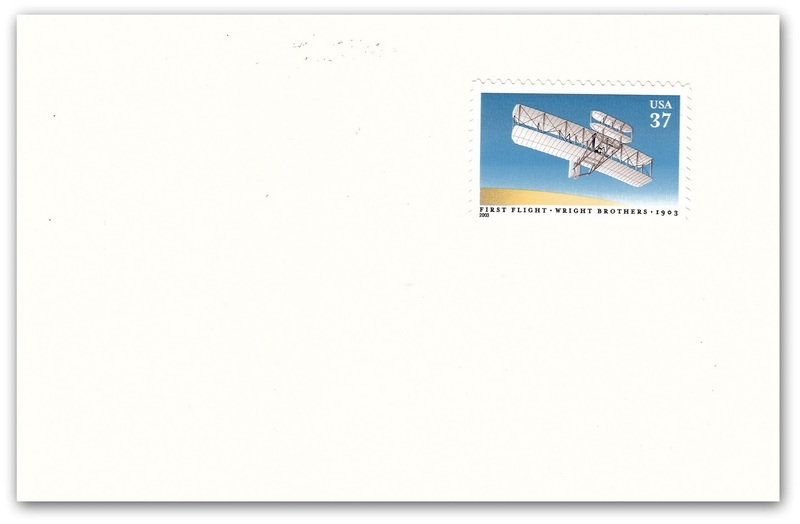 Outgoing postcard US-3772207 to Brazil has a 37-cent First Flight commemorative stamp in the front, issued by USPS on May 22, 2003 to commemorate the 100th anniversary of the first controlled, powered, and sustained flight in a heavier-than-air flying machine. At Kill Devil Hills near Kitty Hawk, North Carolina on December 17, 1903, Wright Brothers tested Flyer I with a four-cylinder engine for the first flight that lasted 12 seconds and 120 feet or 37 meters, followed by three even more successful flights later that day. 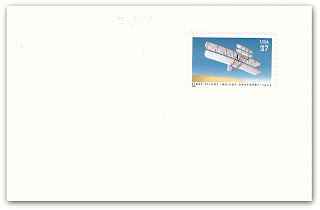 The miniature souvenir sheet has ten pressure-sensitive adhesive (PSA) stamps. The card has address, messages and additional postage on the back. 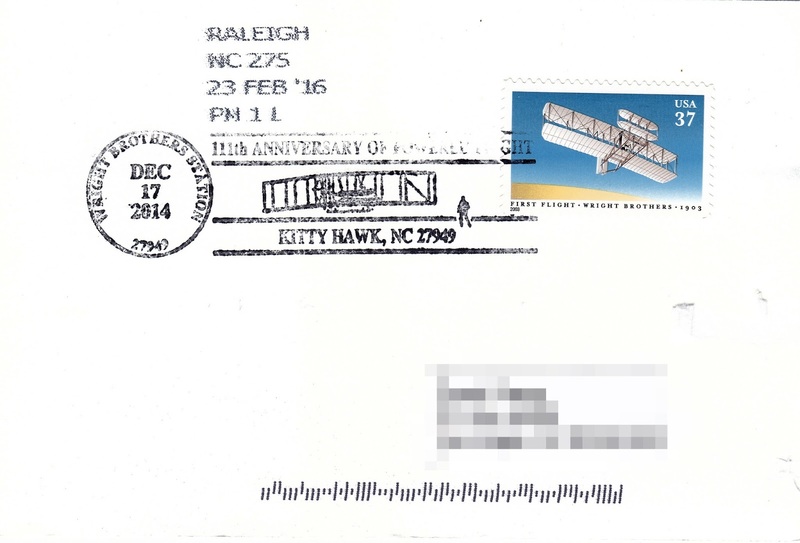 It was sent to the Post Office in Kitty Hawk, NC for the 2015 edition first flight pictorial postmark in a package with several other postcards. Tracking shows the package left Las Vegas on January 16, 2016 and was delivered in January 19, 2016. I did an inquiry on February 22, 2016 for the service update via USPS.COM, and got a prompt call back the next day asking me for more information, and another call the day after informing me that the cards were mailed out on Monday, February 22, 2016. 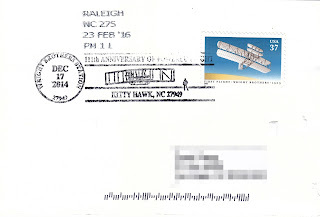 Sure enough, I received the one addressed to myself today on February 26, 2016. However, the SURPRISE was that they used the 111th anniversary edition rubber stamp from 2014 with a date of "DEC 17 2014", rather than the 112th anniversary edition on Dec 17, 2015 !!! Interesting.